Finding the perfect birthday greeting for a friend, family member, or that special someone doesn’t have to be a stressful, unpleasant experience. A birthday is a fun and fabulous event so why should creating a memorable birthday greeting be anything but enjoyable and fun?! After all, if the birthday girls and boys know how much you really love them, they wouldn’t mind you teasing them a bit. Some carefully expressed humor never hurt anyone. So, it’s time to find the perfect birthday greeting you can personalize for that someone special. You don’t just want to use any ordinary generic birthday greeting. You need something that’s enduring but lighthearted, something specific to the recipient’s personality. We have rounded up the best, foolproof greetings for you. 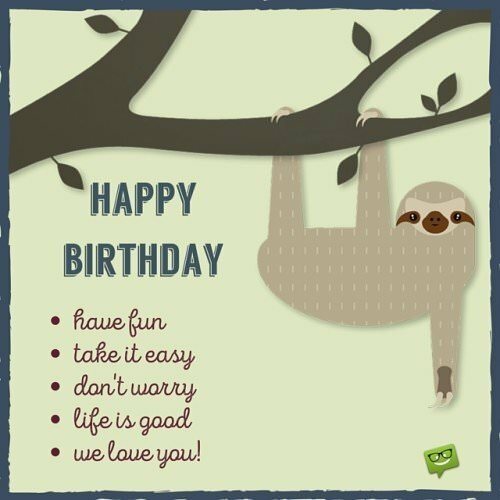 Below, you will find charming, humorous birthday greetings specifically for Him, for Her, and for Awesome Friends. 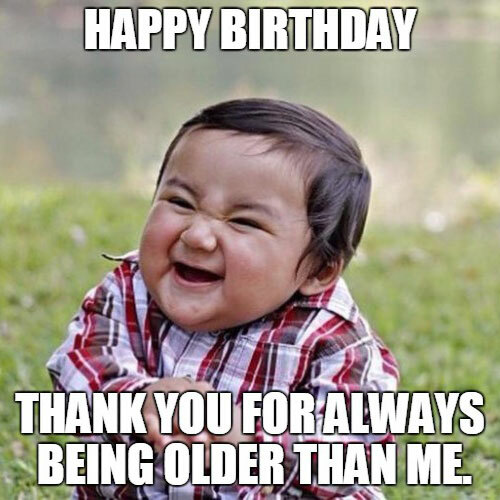 You are guaranteed to find the perfect birthday greeting for someone special! Happy Birthday from someone who puts up with your belching, farting, scratching, and remote control hogging! I hope you don’t mind that I bought you a cake to give to your mom, congratulating your mom for going thru labor and giving birth to you. I mean, she was the one who did all the work. You just kinda popped out! Happy Birthday! I didn’t even have to be reminded by Facebook that it was your big day today! Impressed?! Happy Birthday to you! For your special day I’ve arranged a tour of the local assisted living facility! If we get your room reserved now, you get a 20% discount! I hope you enjoy your amazing day! Happy Birthday, you old fart! You might not be Christian Grey but I still love you more and more with each passing year! Happy Birthday to you, my better version of Mr. Grey. Congratulations! You’re now one more year closer to being known as the ‘dirty old man’!! Happy Birthday to you on this incredible day. I’m sorry I couldn’t get Kate Upton climb inside the gift box. I still hope you like what I got you! Happy Birthday to a dirty old man! Happy Birthday to you, my dearest! I hope your birthday is less exciting than King Joffrey’s wedding! Congratulations! 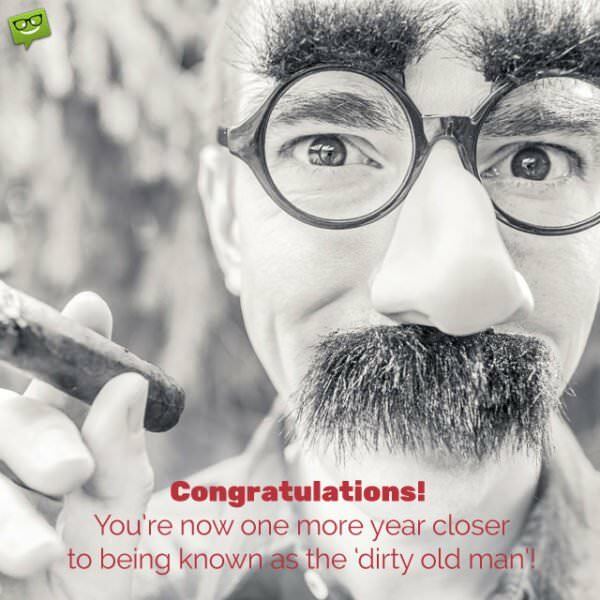 You’re now one more year closer to being known as the ‘dirty old man’! Happy Birthday. Happy Birthday to someone who is comparable to fine wine and aged cheese. You get better with age, my dearest! Happy Birthday to someone who doesn’t quite look as old as a dried up prune yet. May all your dreams and wishes come true today and every day. Happy Birthday to someone who doesn’t know how to load a dishwasher or fill the gas tank on her car! Roses are red. Violets are blue. Sugar is definitely not as sweet as you! Happy Birthday to you! May your day be filled with nothing but roses! Happy Birthday!! You are one-in-a-million and I’d rather spend the day celebrating your birthday than anything else—except for watching football, baseball, or hockey. I’ve decide I’m not old. 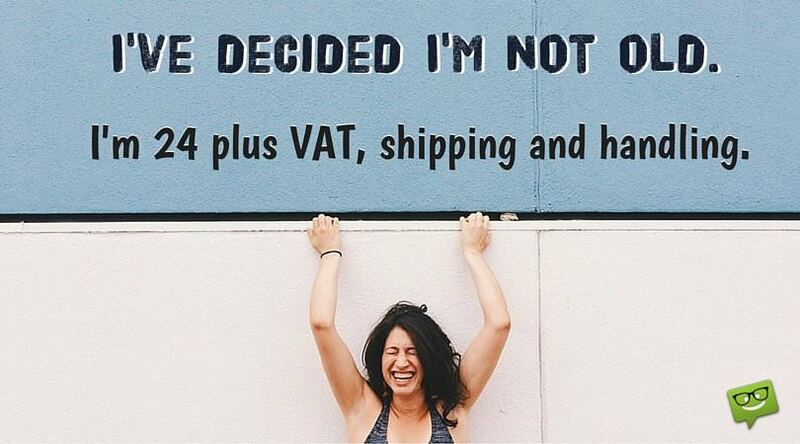 I’m 24 plus VAT, shipping and handling. 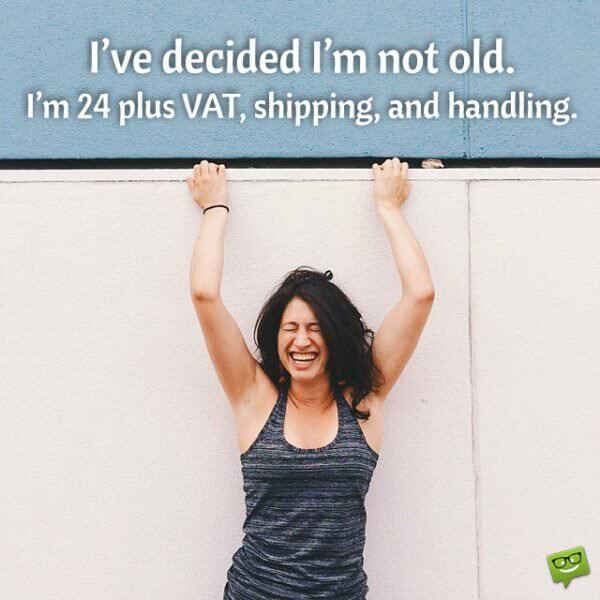 You definitely don’t look a day older than the age you tell people you are! Happy Birthday to someone full of sugar and spice and everything nice. Happy Birthday to the greatest female homosapien to ever walk the planet! Evolution stopped when it created you! Happy Birthday to someone who can make yoga pants and hair bands look hot! Happy Birthday to an incredible girl! I hope your birthday is perfect and you get everything you’ve ever dreamed of—except for Channing Tatum. I’ll have none of that! Happy Birthday to someone as devious and sneaky as me! You’re a girl’s perfect partner-in-crime! May we have many more crazy adventures together! Always remember that every time birthday candles are blown out a bottle of wine is born! Happiest of birthdays to someone as amazing, incredible, and wonderful as you! I just wanted to tell you that I won the lottery and I plan on giving half of my winnings to you in honor of your special day! So, I will be enclosing $1.50. Happy Birthday! Don’t go spending it all in one place now! Happy Birthday to someone that I would want as my getaway driver if I ever decide to rob a bank. Just saying. I hope your day is ridiculously off-the-hook!! Happy Birthday, you sweet young thang! I hope your birthday is unbelievably amazing! From one amazing person to another—Happy Birthday!! You are so incredibly lucky to have such an awesome friend like me! Happy Birthday! May your day be full of happiness, laughter, love, and of course the most important thing—wine!! Happiest of birthdays to the happiest and chattiest person I’ve ever met! May your birthday be your dream gab fest full of lots of juicy gossip and rumors! One does not simply wish a happy birthday without the requisite dolling out of a birthday spanking! 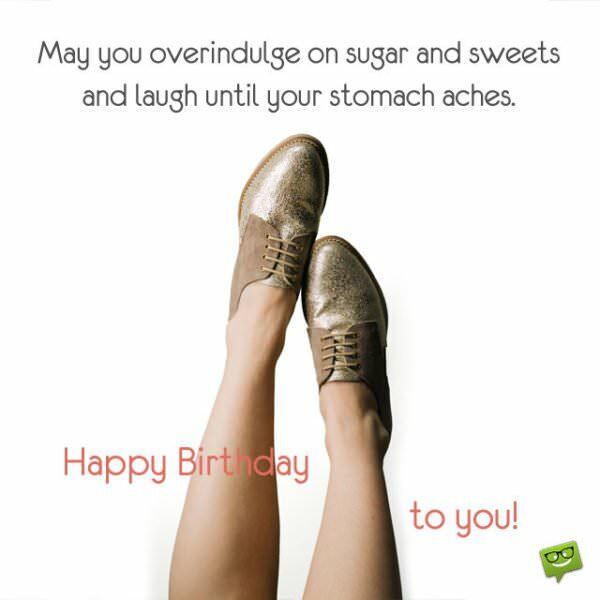 May you overindulge on sugar and sweets and laugh until your stomach aches! Happy Birthday to you! I had a very difficult time finding a gluten free, GMO free, soy free, vegan birthday cake so I guess we’ll celebrate with some delicious frozen water, also commonly referred to as ice! Happy Birthday to you! Cheers to another amazing year! On your big day I thought we’d go to the zoo but the signs say no pets allowed on the premises so we’ll have to come up with something else since you wouldn’t be allowed in. Happy Birthday you big stinker! Best Wishes on your birthday! I bet you’re totally over-the-moon excited that you are now another year older and another year closer to collecting that 5% senior citizen grocery shopping discount! Happy Birthday, you old fart! Why did the chicken cross the road? To get to the other side…to wish someone special a very happy birthday! 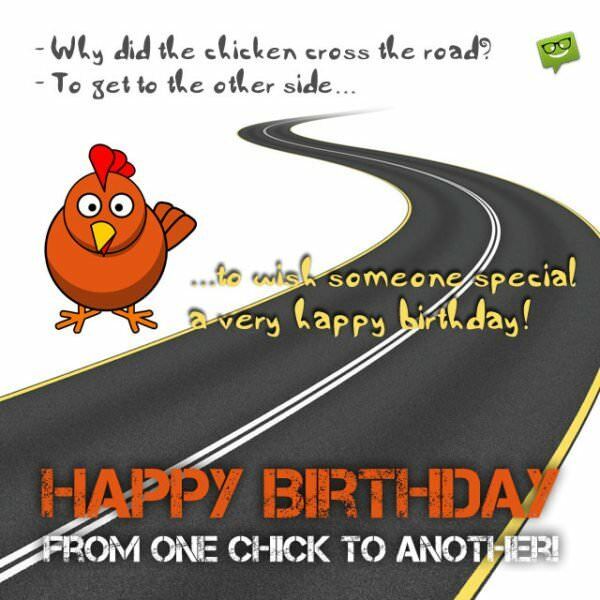 Happy Birthday from one chick to another!